SOAP. With the benefit of hindsight: the word was well-chosen, wasn't it? We have SMTP for sending and receiving messages across the globe, what was wrong with that? It even relays messages, guarantees delivery or at least delivery notifications. It has a retry mechanism, it can send text and binaries and attachments, it can handle all kinds of encodings - need I go on? What is it with reinventing the wheel that persists throughout IT? And why don't people just copy the things that work, when they want to copy an existing concept? 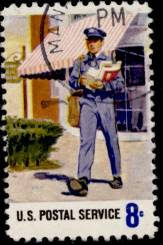 Look at the mailman: every mailman in the entire world is capable of delivering any letter sent from and to any place in the world. So, even before SMTP existed, there was a perfect, well thought-out, proven technology of sending and receiving messages on a global scale. Wow! And yet, SOAP has been officially in existence since 9 years now, and its envelope doesn't have any required fields other than "A [local name] of Envelope" and "A [namespace name] of "http://www.w3.org/2003/05/soap-envelope". So, let's just stop with SOAP. It's never going to work anyway. It will end a lot of misunderstandings, discussions, and save an awful lot of time & money.